We’d love your help. 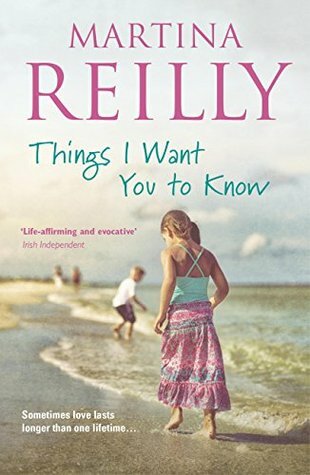 Let us know what’s wrong with this preview of Things I Want You to Know by Martina Reilly. A poignant, heartwarming novel of love, loss and hope for the future, for fans of Me Before You. Five dates with five different women. Nick isn't sure his heart is in it...but as he tries to follow Kate's careful instructions, he slowly realises that it's not romance Kate wanted him to find, but something far more important. Will Nick find the courage to take a second chance? To ask other readers questions about Things I Want You to Know, please sign up. Nick has lost his way in life and his wife Kate has told him to leave the family home and his very young children and sort himself out. During his period of soul searching, Kate becomes terminally ill and eventually dies. Nick returns home to take on responsibility for his children who are traumatised by the loss of their mother, especially Emma who is convinced Nick will leave again. Kate has left Nick a video telling him he must find himself and move on with the children. Not an easy task as Nic Nick has lost his way in life and his wife Kate has told him to leave the family home and his very young children and sort himself out. During his period of soul searching, Kate becomes terminally ill and eventually dies. Kate has left Nick a video telling him he must find himself and move on with the children. Not an easy task as Nick is bereft at the loss of Kate but also cannot find it in his heart to forgive himself. Kate has also left Nick a book about the routines for the children and telling him 'Things she wants him to know..' This includes 5 dates with people who she feels can help him on the road to recovery. This book…. This book will have you laughing one moment, and tearfully emotional the next. It is just a stunning read and the whole book traverses the peaks and falls of loss and parenting artfully with the right amount of humour and the right amount of respect. I think that this is the first of her books that I’ve ever read and after reading this one I’ll definitely be exploring the others. Nick and his wife were separated when she sadly passed away after a short battle with cancer. She leaves Nick their two children and just a single book that she has put together to help him manage parenting. Nick left the family home some time beforehand and he has to navigate his way back to two young children who aren’t a hundred per cent sure who he is. In the book are five dates that Kate want’s Nick to go on, which she set up before she died. Through these and through little bits of the past and watching Nick move into the future, we learn exactly what led him to be where he is today. With Nick we find out the man he can become and how he can move forward with his life – with lots of funny anecdotes, great humorous moments and excellent characters in his two children. Beautiful heartfelt story. Just felt the crude language and blasphemy did not fit and was so unnecessary! This is the best book ive read in ages...and I read a LOT of books. A modern day Marve Binchy with believeable characters. Love this book. The story flowed and was so real . What a rollercoaster of emotions, grief, happiness, the laugh out loud and tears! This is the first book by this author that I have read and if it is anything to go by it won't be the last . Funny bits sad bits but overall just a great book. This book is a lovely heart warming story of love even after death. However I personally found it a bit of a slow burner! Nick hasn't had an easy ride, and now he's lost his wife, Kate to cancer. Now he is faced with bringing up their to children, Emma and Liam alone. But Kate doesn't want to be forgotten and leaves Nick with a book that she has put together, title, Things I Want You To Know. The book contains everything from family photos to baking and even the children's routines. With the help of Kate's book, Nick manages to plan Emma's Communion and even brave the local Mother and Toddler group. Although Nick d Nick hasn't had an easy ride, and now he's lost his wife, Kate to cancer. Now he is faced with bringing up their to children, Emma and Liam alone. But Kate doesn't want to be forgotten and leaves Nick with a book that she has put together, title, Things I Want You To Know. The book contains everything from family photos to baking and even the children's routines. With the help of Kate's book, Nick manages to plan Emma's Communion and even brave the local Mother and Toddler group. Although Nick doesn't know it, Kate has set up five dates for Nick to go, starting the Saturday six weeks after she dies, with one every six weeks after that. These dates are with women that were close to Kate and the aims is to bring back fond memories to Nick. The book is written in intervals of Nick's point of view and his daughter, Emma's. I loved how it showed an adults take and a child's take on the same subject. It made the book fun to read, and Emma never failed to make me laugh. The characters were hugely likable. Nick is a character that I won't forget, and other characters, such as Lenny and Marcy, Emma's godparents, really added to the book. As did Emma and Liam. I really cared about these characters and I felt like I was in the book. I was glued to it from the very first page and I just got lost in it. Martina Reilly truly knows how to write about seriouse occasions and paths in a way that makes you feel the pain but still lets enough space for your own feelings towards the characters. I loved this book (though it is not Martina's best book, in my opinion) and it was so well written that it took me not so long (after I had the make a pause because of some business I had to take care of) to finish it. I think the only think I would have to criticise is that somehow the ending was so sudden. This Martina Reilly truly knows how to write about seriouse occasions and paths in a way that makes you feel the pain but still lets enough space for your own feelings towards the characters. I think the only think I would have to criticise is that somehow the ending was so sudden. This kind of got to me and I had to wait a few day to start a new book. It has it's advantages as well, since it's kind of an open end everyone can imagine the end of the family's story as one wishes. Im a huge Martina Reilly fan and I have read all her books and just loved them. This one didn't disappoint .From the beginning it grabbed me into the story . I love that it was written from a male perspective and I completely fell in love with his kids. I cried and I laughed and I cried some more! If i could find one negative is the story ended too soon and i didn't want it to end . I did not quite know what to expect. And I was pleasantly surprised. The book read well, I liked the characters, and I liked the plot. It is not a 'heavy' book but it still had substance. Will read more by this author. Really enjoyed it,it was a complete story. would loved to have given it a 4.5! Hi. It’s Martina Reilly here, the artist formally known as Tina Reilly! And before that, I was teen writer, Martina Murphy.